Maptitude is the ideal mapping software for use within the banking industry. GIS is a critical tool in today's banking environment, where there is increased competition both from existing and new banks, as well as from new companies such as Internet and phone banks, and from retail-based incursions into traditional financial markets. Maptitude provides those in the banking and financial industry with the geographical tools to obtain the answers to compete effectively, and to ensure compliance and customer service levels. Using Maptitude you can visually simplify the weighing of the pros and cons of different sites for branches and ATMs/ABMs/cash machines. You can pinpoint where your customers, facilities, and competitors are with powerful address locating and database management and query tools. You can then examine the demographic characteristics of your customers with the included Census data. Provided with this knowledge you can identify underserved areas, analyse your competitor's market, and create an acceptable branch and cash machine network. Use your own data or the Census demographic data to identify the market areas, communities, or postcodes that have particular characteristics so you can target your marketing efforts. For example, you can identify locations with high mortgage costs to target an advertising campaign about your refinancing mortgage programs, or find the customers who are within several miles of a new branch or ATM/ABM/cash machine location for a specialised mailing to inform them about their new banking options. "My bank just purchased the Maptitude software for our assessment area mapping project, and I just love it. You import all your data into the software from an excel spreadsheet." By examining your branch locations, the locations of competitors, and demographic characteristics, you can identify areas worthy of expansion or determine market share. 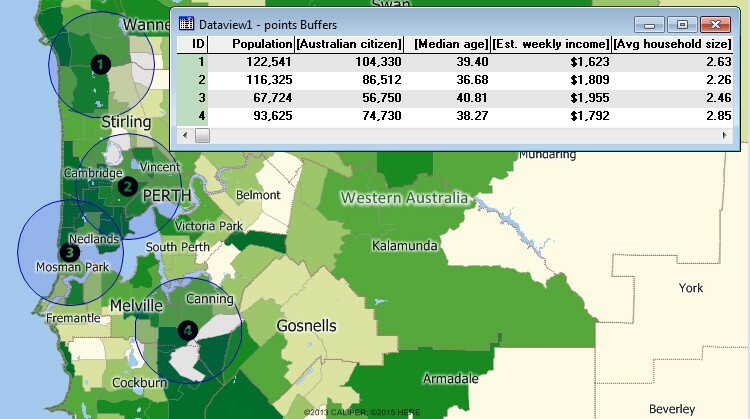 Maptitude includes demographic data useful for banking. 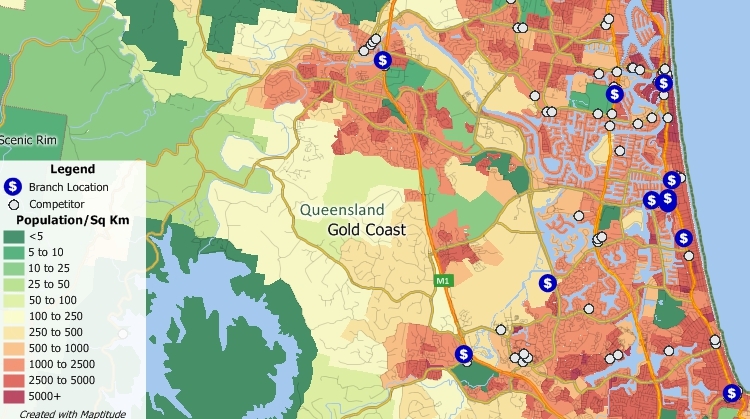 This map shows a colour theme of median monthly mortgage costs that can be used to identify markets for refinance offers. Compute the demographics around different sites to compare and evaluate locations for bank locations.